The news about the naval unit release was so understated that it didn’t exist! 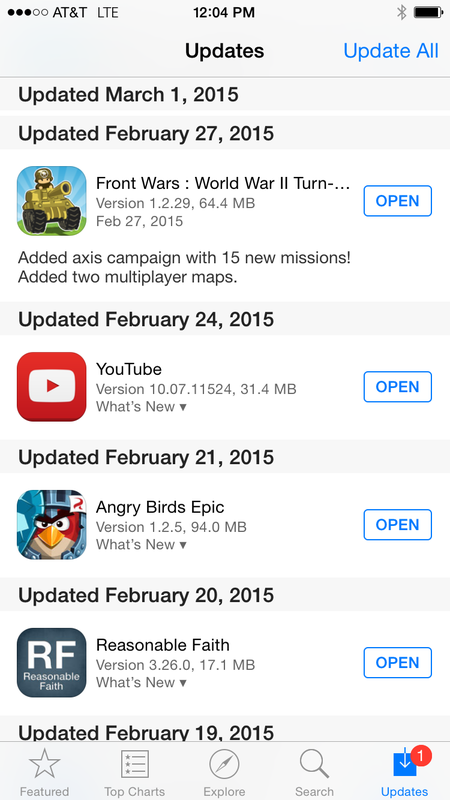 Added axis campaign with 15 new missions! While I was stoked for two new maps (one can never have too many multiplayer maps), I quickly became even more excited when I actually tried out said maps. When I did, I realized Challant had been overly reserved in his update description. What wasn’t revealed in the update details is that, with the patch, he secretly slipped in an entire new class of units – naval units!! …and the new units look even better! 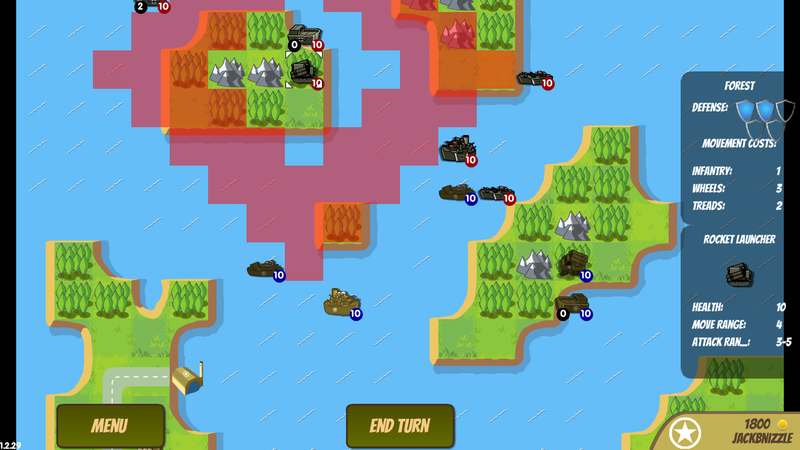 Anyone familiar with the Advance Wars style of TBS game will quickly understand these units. The Transport Ship is inoffensive, used only for carrying units (maximum of two). The Carrier is strong versus air and subs, the Submarine is strong versus Battle Ships and other subs, and the Battle Ship is a mighty long-range attack craft, strong versus everything. 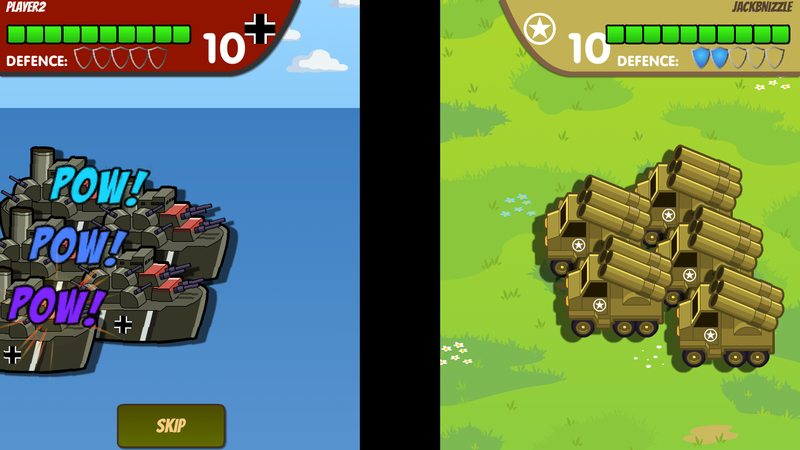 However, I quickly noticed a couple of subtle differences in how the units are used in Front Wars versus Advance Wars. 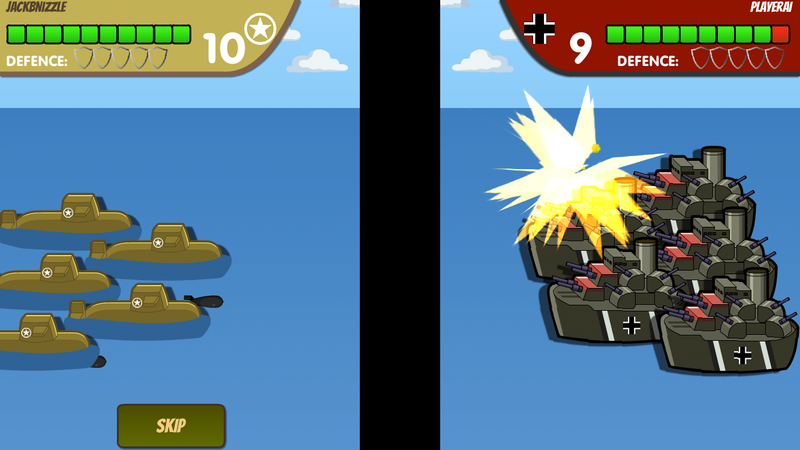 Sea-to-land battles are the best! 1. The Transport Ship can unload units anywhere (except into water – duh!). 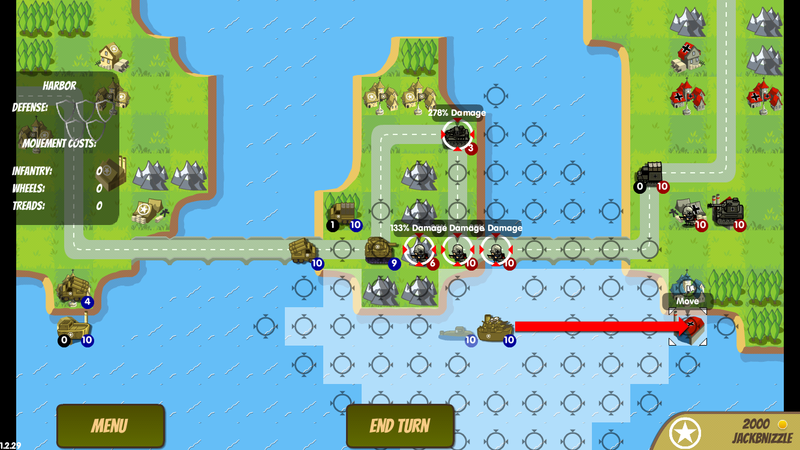 In the Advance Wars series, transports could only ever unload units at beaches or ports. Every other location was off limits. 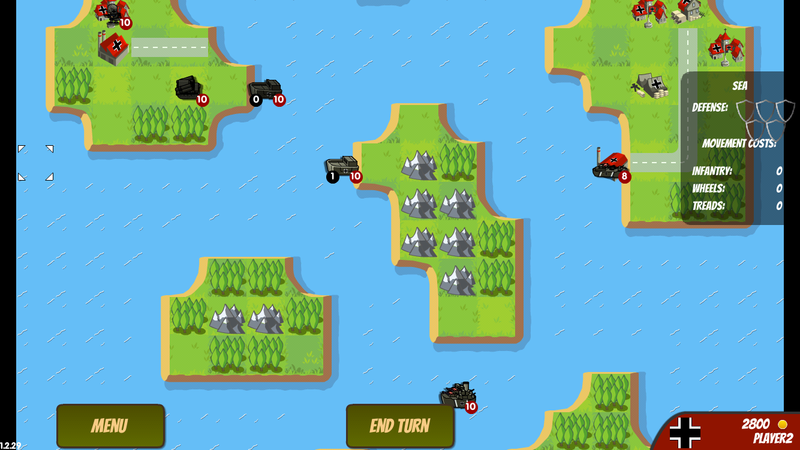 Front Wars foregoes this limitation, allowing players to unload transports on any stretch of land on the map. While I think that the AW system is good and provides for an extra level of strategy, I like Challant’s choice here. His approach to FW has always been to provide a slightly simpler version of war game than that found in the AW series, and this adaptation falls right in line with that philosophy. Not having to worry about unloading troops only at beaches/ports opens up possibilities for players that just aren’t there in the AW series. Sea-to-sea battles are also the best! 2. Ships cannot go under/through bridges. 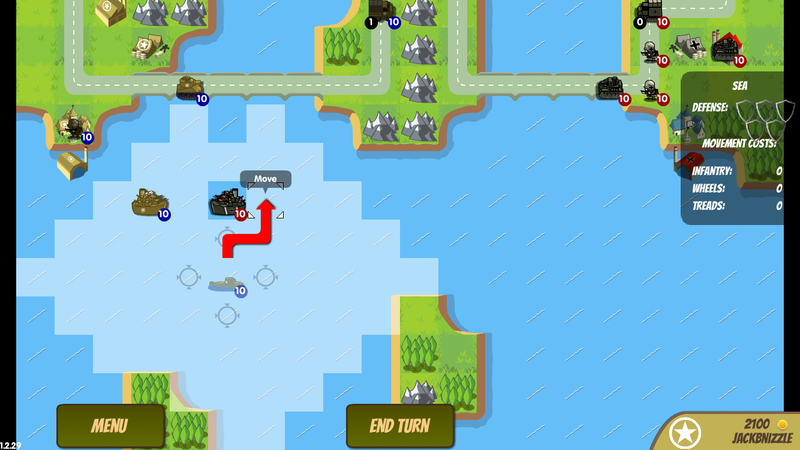 In the latest edition of AW (Advance Wars: Days of Ruin), ships could pass under/through bridges. In the earlier editions, they couldn’t. FW treats ships just like the earlier AW games – ships cannot pass under/through bridges. Just like the earlier AW games, this limits naval operations considerably. On the other hand, like the earlier AW games, this doesn’t hurt the fun value of the game. 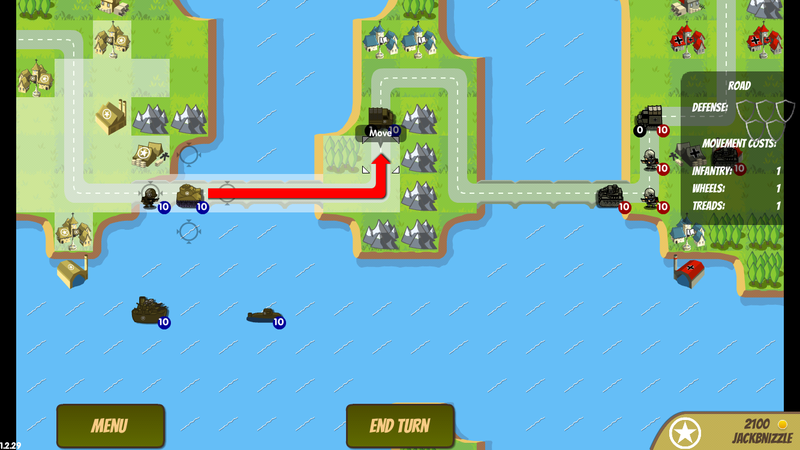 AW-type games have always had little quirks of non-realism that players dealt with, like airplanes blocking the paths of tanks and ships (including submarines) not going under bridges. It is just part of the game, and players still love the games, so it clearly isn’t a devastating issue. 3. Battle Ships cannot move and fire in the same turn. Again, in AW:DoR, Battleships could move and fire in the same turn. But, in every other AW game, they couldn’t. Such is the case in FW; Battle Ships must move into position in one turn and then fire the next. Since Battle Ships are essentially floating artillery, it makes sense that they would be treated akin to land-based artillery. This “set up then fire” mechanism is neither annoying nor troublesome, and I think players will take to the mechanics with ease. Let the battle for the island commence. In all, I find this to be the most substantive update yet, and I sense there is more to come. I noted above that Carriers are strong versus AIR and subs – well, neither of the new maps contains air units. So, it seems that, since Carriers are made to engage air units, we will see some new maps forthcoming featuring air and naval units. Until then, enjoy these new updates!